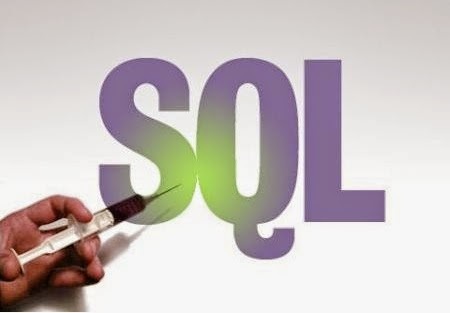 SQL Injection flaw is quite easiest to exploit and protect too but only when you know how to do it. In continuation to our Injection attacks tutorial series, today we will learn about Union Exploitation Technique to exploit SQL Injection Vulnerability. Union exploitation technique is most common and easiest way to exploit SQL injection vulnerability to hack into websites and if you know how to do it then its same the other way around i.e. Protect SQL Injection vulnerability to be exploited by Union Exploitation technique. So lets learn about Union Exploitation Technique in detail with help of examples. Union Exploitation Technique to Exploit SQL Injection Vulnerability | Injection attacks – Part 8. Note: This article is for education purposes only. Any misuse may lead to harsh cyber law charges and even imprisonment. But before that let me brief all of you about what is Union Operator? Union is an inbuilt keyword in almost all databases which is used to join a query. In SQL, we normally used Union operator to link another SQL query with original query. Hackers use this concept to exploit SQL Injection flaws to run their own SQL queries to retrieve information like usernames, passwords and other juicy information from victims databases. 1. Find the Vulnerable website which is vulnerable to SQL Injection. 2. Find the Number of Columns in website using Order by clause. 3. Find most vulnerable columns which can be used to exploit SQL Injection Vulnerability using Union operator. 4. Test run to validate that column found is vulnerable by querying version information. 7. Use Information Schema to get Column values. For example: Username, passwords, customer information. There are several other dorks to find SQL injection vulnerable websites but above one is easiest and success rate almost 90-95%. Now if you get error something like below, then it means website is vulnerable to SQL Injection. Result : Some page opens with data i.e. no error page.Then incrementing it by 10 i.e. This steps will give exact number of columns in the database of website. Step 3: Finding Vulnerable Columns using UNION ALL clause. Wow, now you have some numbers scattered over web page, which means vulnerable columns on website. Now in place of 2 on web page you will get the version number displayed. Check this for all vulnerable columns. Using information schema we can execute query as if we are administrators. So in order to extract table names we will run below query on column 2 (vulnerable column). Above query will result into displaying usernames and passwords in below format username:password as 0x3a is hex value for ‘:’.That’s it guys, now you have username, password, table names, passwords. What else do you need.That’s all for today, we will continue to learn more about injection attacks in later tutorials.If you have any queries of doubts, feel free to ask. Welcome friends to KYB (Know your Backtrack) Tutorial 4, today i am going to teach you another interesting DNS Information gathering tool i.e. DNSRECON Tool. DNSRECON Tool like other DNS tools used to enumerate the standard records of a domain like A, NS, SOA, MX etc. So friends lets learn all about DNSRECON Tool on Backtrack 5. For performing Domain Brute force technique, we have to give a name list and it will try to resolve the A,AAA and CNAME records against the domain by trying each entry one by one. DNS cache snooping happens when the DNS server has a specific DNS record cached.This DNS record will often reveal plenty of information about the name servers and other DNS information.However DNS cache snooping does not happen quite often because servers normally do not cache DNS records. There are lot of other options that DNSRECON tool provides. It is an extremely useful tool to gather plenty of information about DNS records. Thats all for today. If you have any doubts feel free to ask. Don’t forget to join us at Facebook in order to recent updates. 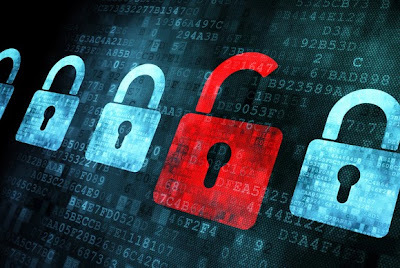 Hacking Hackers Phish Pages to View Hacked Facebook and Email accounts using Google : Welcome friends, today i am going to teach you how to see the hackers illegal phish pages password file using Google, which all the passwords of victims are stored. As we all know 99 % hackers over internet are novice hackers or simply script kiddies. They don’t know the concepts and they just follow or use the material available on internet to create Phishers to Hack Facebook, Gmail or simply passwords. Which always result in creating Phisher successfully but not a secure one because none tells the after phisher technique like how to make phishers undetectable, how to protect password files where all hacked passwords are stored etc. As most of us know that Phishing is the easiest method over internet to hack Facebook and Email account passwords, so most novice hackers opt this option to hack victims passwords. In fact some professional hackers uses Phishing technique too but they are bit advanced and prefer tabnabbing(click here to learn more) over Phishing. As Hackingloops concentrates on concepts and digging the root causes. We will learn something better that no body does or tells i.e. how to hack the hackers. What loophole we are digging today?? Any idea?? No ?? So go on. Most of us who are webmasters i.e. people who design websites knows the concept of Google indexing but others might not have that good idea. So let me explain first. How any website results appears in Google search results? You made the website and how does Google knows you website? All search engines uses spider and crawler software’s over the web to index the new websites or latest changes in the existing websites in order to give users the best latest results. And indexing of website depends on a file located at root level of all web hosting websites, if its not present Google treats as full index. Most people think that robots.txt file is used to tell Google to index your website but actually robots.txt file used to tell Google that what you want to index from your website and what you don’t want. By default, robot file allow full website indexing i.e. all files are indexed even password and database files. Woooo! Here the loophole lies. Most almost all hackers uses free web hosting websites to run the Phish pages and all free web hosting websites have default robot.txt file which means when hacker uploads its phish pages, its indexed by Google. And we all know what we use to extract smart information from Google? Off course its Google Dorks. Now we have to learn how to make our own dorks to extract hackers phish page information. Hackers edits Form redirects of any login page and change the request mode from POST to GET in order to retrieve passwords in plain text and then they stores it in simple text and html files. Today we are going to learn how to extract those password files using Google. Well there is not much to learn in it because i have already made the DORK for you, what you have to do is just enter the same in Google and you will have access to all Hackers Phish pages password files containing all the hacked password they hacked till now. Just open the Google search and enter the above dork into it, you will get all Phish page password files. Hope you all like the noobie way to view all the hacked passwords. There are several other ways to hack the hackers in smart way. We will learn that in future tutorials. Enjoy Happy Hacking ! Have Fun! Hackingloops is back with another Know Your Backtrack Tutorial. In this tutorial, we will be learning DNSMAP Tool for DNS information gathering. DNSMAP, as the name suggests, is DNS Network Mapper, which is used for multiple purposes. Basically, DNSMAP is an passive Network Mapper, often called a sub domain brute force tool. This tool is mainly used by penetration testers and hackers for DNS and sub domain information gathering. It is similar to most other DNS information gathering tools except for a significant feature. Obtain all A records (i.e. IP addresses) associated to each successfully brute forced sub domain, rather than just one IP address per sub domain. Abort the brute forcing process in case the target domain uses wildcards. Ability to run the tool without providing a word list by using a built-in list of keywords. Brute forcing by using a user-supplied word list (as opposed to the built-in word list). Saving the results in human-readable and CSV format for easy processing. New bash script (dnsmap-bulk.sh) included which allows running Dnsmap against a list of domains from a user-supplied file. i.e. : brute forcing several domains in a bulk fashion. Bypassing of signature-based Dnsmap detection by generating a proper pseudo-random sub domain when checking for wildcards (Unique Feature). Why to use DNSMAP Tool ? 1. Find interesting remote access servers. 2. Find badly configured and/or unpatched servers. 3. Find new domain names which will allow you to map non-obvious/hard-to-find net blocks. 4. Occasionally you find that some brute forced sub domains resolve to internal IP addresses (RFC 1918). This is great as sometimes they have very up-to-date “A” records, which means that it *is* possible to enumerate internal servers of a target organization from the internet by only using standard DNS resolving (as opposed to zone transfers for instance). 5. Discover embedded devices configured using Dynamic DNS services. 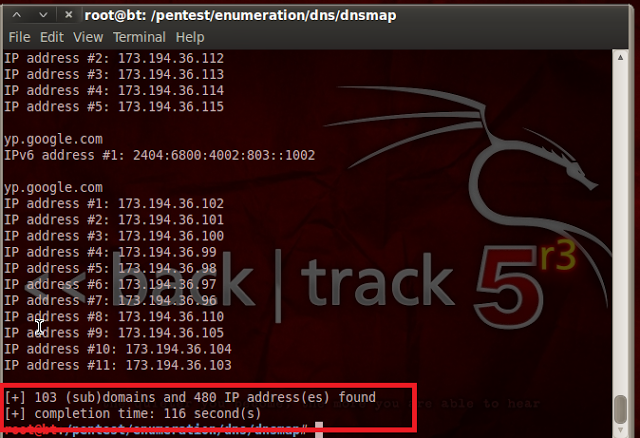 How to use DNSMAP tool on Backtrack Linux ? 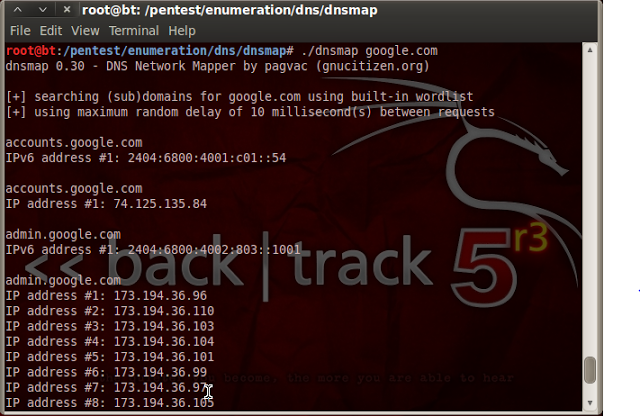 You can see above that DNSMAP has scanned all the sub domains of Google along with all A records i.e. IP address of Google sub domains. If you have a custom wordlist of subdomains, you can use that as well simply by specifying the -w argument and then the path to the wordlist.